Please note that this sugar scrub recipe post contains affiliate links. If you click on the link and make a purchase I will receive a few pennies to put towards my adventure in blogging. With the advent of a new year comes a renewed determination to get healthier, spend less money and take more time for myself. In reality I will probably end up just drinking more coffee and buying more frozen pizzas than I should but I like to start the year off on a positive note. This easy sugar scrub recipe will hopefully help me accomplish all three of my goals for the new year. It will help me get healthier by exposing me to fewer chemicals whose names I cannot pronounce. It will help me save money because store bought sugar scrubs are ridiculously expensive. And I will definitely use this sugar scrub recipe to pamper myself this weekend. Of course, like most moms I will have to lock the bathroom door and turn up the music to drowned out the sound of the dog barking and the kids yelling. I have no magic formula to solve those issues but hope you enjoy this sugar scrub recipe anyhow. 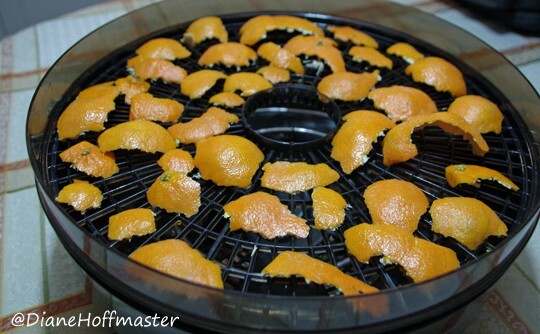 I used my dehydrator to dry the orange peels but you could just leave them at room temperature for a few days out of direct sunlight. You could also just put them in the oven on low for a few hours on a cookie sheet. My kids go through Cuties like they are candy so I have tons of orange peels around at any given time. You could save them up for a few days in the fridge in a plastic bag if you don’t eat quite as many of them in your house. Just a quick note: I used my food processor to pulverize the orange peels. I did not get it quite as fine as I was hoping. Next time I will clean out the coffee grinder or buy a spice grinder and use that instead for a more finely ground orange powder. 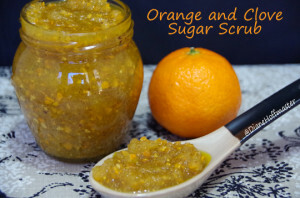 Depending on your scent preferences you may not even need additional orange essential oil in this sugar scrub recipe. If you have whole cloves you can use those but again, they didn’t grind down as well as I had hoped in the food processor. I think they would be fine in a spice grinder but I also added additional ground cloves at the end for a stronger aroma. This recipe makes enough for 2 to 3 hot showers worth of scrubbing, depending on how much you use. I don’t like to store homemade sugar scrubs for very long so I recommend making more as needed. An easy homemade sugar scrub recipe that smells incredibly refreshing! Store in airtight container out of direct sunlight for up to 1 week. To Use: Scoop out a handful and scrub over wet skin gently. Rinse with warm water and pat dry. If you enjoy this sugar scrub recipe you might enjoy my other DIY beauty product recipes. Let me know what you think if you try this scrub. If you would like to share this recipe with your own followers you can use any of the social sharing tools on the post or just retweet below! Thanks for following my blog and I look forward to sharing more of my creations with you this year! Oh that is brilliant. Citrus is so amazing for your skin; and this is going directly to the source! Love it. 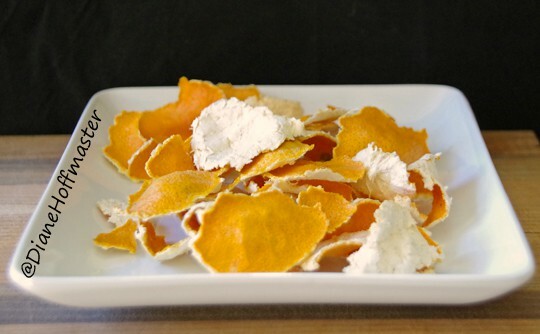 I love sugar scrubs but have never made one out of dehydrated orange peel! Great idea. I love clove, and though I've never tried to, I'm interested in dehydrating those peels! I don't know what I want to do more, eat it or rub it on my body. It sounds so refreshing, and I love all citrus smells. Thanks for sharing, as this looks easy to make! Orange and cloves sounds yummy. I just found my dehydrator. I need to try this. I bet those orange peels smelled amazing as they were drying out. I love the idea of making a homemade scrub and this recipe seems easy enough. Perhaps I'll give it a try with my oldest daughter. She's 10 and loves to make things! yes, the house did smell amazing and it only took overnight to dry them out!